You’re obviously the best and most qualified business in your area right? How do you demonstrate that to your customers? Blog! Write posts about subjects that demonstrate your knowledge of your area of business. If you’re an accountant, blog about new unknown tax laws, or write a post on how to work well with your accountant. If you’re in the tech industry, write about new technology that has just been released and how that affects you, or you could write a tutorial on how to do something cool. Whatever you do, just make sure that you write posts for your blog that demonstrate your expertise. The more posts you write, the more reach you have with your target audience, and the better chance you have of reaching someone that needs your service or product. If you already have a website you have probably heard of SEO or Search Engine Optimization. This is the way websites display their content to search engines in order to gain higher rankings for certain keywords. One way to ensure high rank with search engines is to have lots of content. This shows that you aren’t a spam website and depending on your keywords will show how much you talk about a particular subject. Lots of content, along with links to other sites and other sites linking to you, provides search engines with information about your website and they will give you priority over websites without the amount of content that you have. Therefore, having a blog is a great way to build up your content and link to other websites. Lets face it, your customers prefer to interact with people instead of large impersonal corporate businesses. That’s where your blog can come in! By writing engaging posts, you can have an interaction with potential customers that show your business cares. Share your posts on Facebook, Twitter, and other social networks that your customers hang out on. Show them that you are a business full of interesting people that really care about their service/product. Let them comment on your posts and you open up a great opportunity to engage with your customers like you have yet to experience. Answer their questions and really show them that you care. 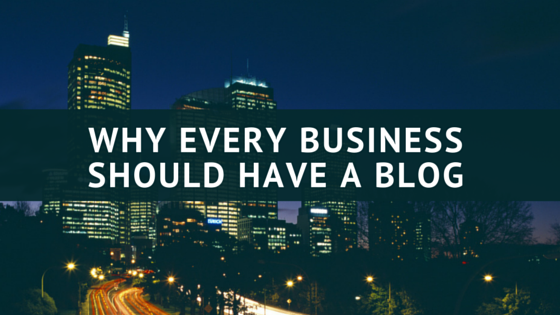 Starting a blog can be the best thing that you can do for your business. It’s not just another expense, it’s an investment. Yes, you will have to put in time and effort, but the benefits far outweigh the cost. It shows your customers and potential leads that you know what your talking about, gets you better search engine recognition, and lets you interact personally. Did that motivate you? Ready to start a blog? Check out my post How to Create a WordPress Website for a tutorial on how to set up one of the easiest blogging platforms out today. Do you have a blog? How has it affected your business?